Welcome to the East Hampton Public Schools! 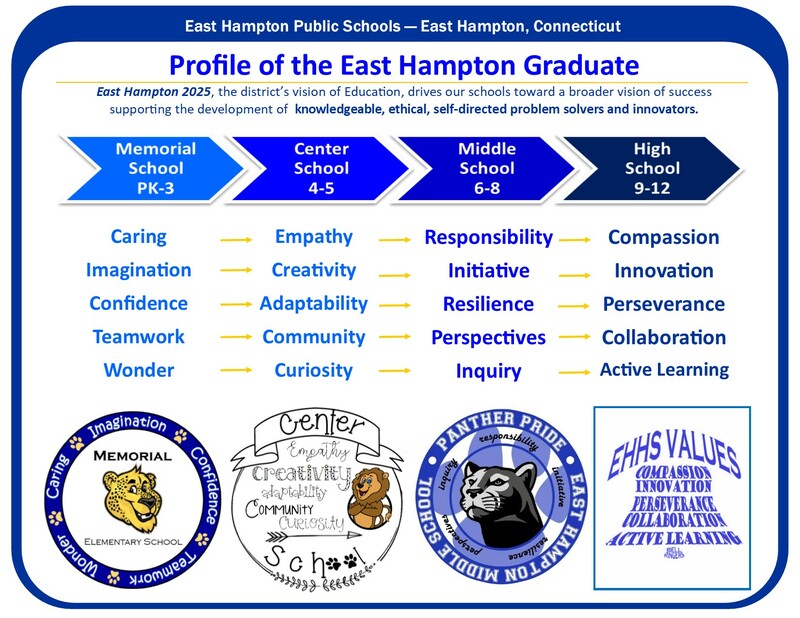 As a proud school community we have worked as a team of teachers, staff members, students, and parents to develop a vision that we call East Hampton 2025 that each year drives our district and building goals, and most recently has led to our Profile of the Graduate. This year we are committed to ambitious goals designed to provide our students the best learning experiences in the classroom. The first district goal focuses on classroom instructional practices. The East Hampton Public Schools will design instructional practices that promote active learners who have opportunities to lead their own personalized learning and who are engaged in inquiry, problem solving, and higher order thinking. Our classrooms are changing and we see great practices beginning to blossom in our schools. 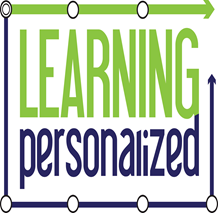 Whether we promote new demonstrations requiring higher-order thinking, genius-hour activities, or digital portfolios showcasing an academic mindset, the goal is to create self-directed authentic assessments that promote relevant, rigorous, and effective learning for every child in the classroom. Our second goal speaks to the next level of our vision for the schools, East Hampton 2025. The East Hampton Public Schools will measure the transferable skills of the East Hampton Profile of the Graduate in order to ensure that students possess the knowledge, understandings, and dispositions necessary for future success. Last spring, we completed the East Hampton Profile of the Graduate, outlining a matrix of the most important transferable skills developed in each school that lead to success as a graduate. While many school districts refer to this as the “Vision” of the Graduate, we expect it to be much more than worthy targets for our students. We have chosen the word “Profile” because we expect it to characterize the skills developed by every one of our students. This year, our goal is to develop rich, engaging learning experiences at every grade level where students know they are working on one or more of the skills in the Profile. Our third goal continues last year’s work where we set the highest standards of inspirational kindness and caring in our schools. The East Hampton Public Schools will take collective responsibility for the emotional well-being of every student ensuring that students are known, valued, and connected to the school community. Last year, we worked to “make kindness and caring common.” This year I am hoping that we can take that notion and make additional strides in our schools, community, and beyond by sharing kindness and sharing compassion. There certainly has never been a more important skill for our children – and I would like to think that our East Hampton children could lead the way in inspiring and spreading kindness and compassion in our society. As a school district, we look forward to watching these initiatives blossom in our schools. This year we will showcase several efforts with our community-at-large. My door is always open to parents, students, and community members. Please don’t hesitate to enjoy a conversation and cup of coffee with me as we work together to make East Hampton Schools the highest performing district in the state. 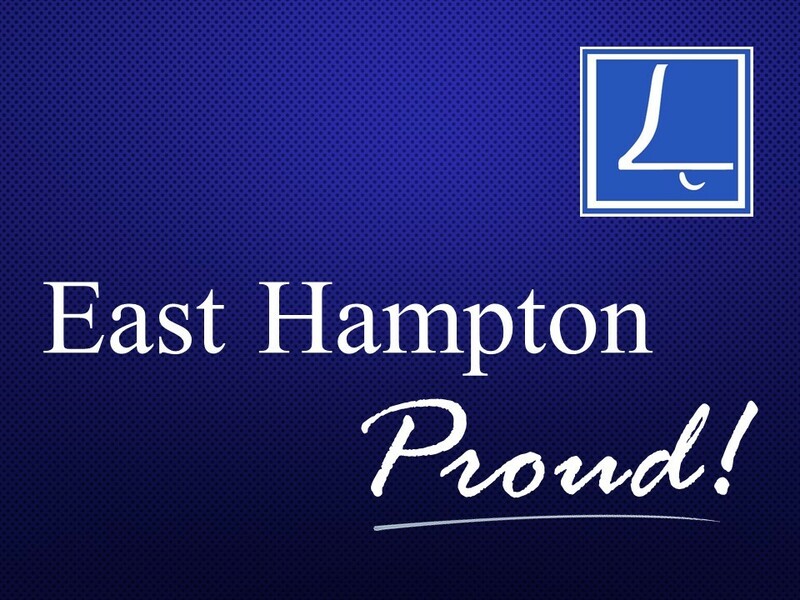 We are East Hampton Proud!